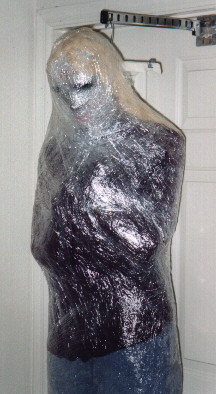 This prop was actually very simple, just clothes stuffed with newspaper, then wrapped in layers of saran wrap. I made the head out of paper mache and put one of those clear plastic masks over it, but you could also substitute a wig form or a mask stuffed with newspaper. It looks best if the face is pale, to make it look like the victim was drained of blood. Since mine was going to be hung vertically, I decided to put a clothes hanger in where the shoulders are, and attach that to the belt loops of the pants with wire. You just have to use your best judgement to figure out where the shoulders are in relation to the pants. Stuff the pants with newspaper (don't worry, the saran wrap hides a lot of mistakes! ), and attach the shoes to the bottom of the pants with safety pins. I folded the arms up to the chest and safety pinned them in place. Hands weren't necessary; they wouldn't have been visible anyway. Finally, go nuts with the saran wrap! It looks better if it's a little bunched up; that makes it look more like strands of webbing. Tie a rope around the loop of the hanger, hang the dummy up, add small fake spiders here and there, and a little fake blood (put down newspaper if you don't want the floor stained)... Add some webs for effect, and you're done! 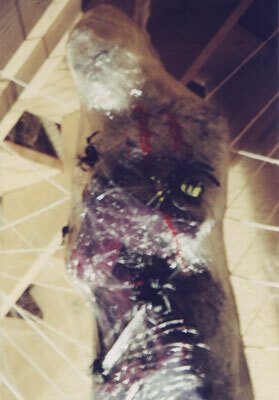 Some working pictures of the victim dummy. The last pic was from she was hung up outside. She wasn't completely detailed yet.